Brown mostly on body, red on back. Brown mostly on body, red on back. The above info came from Hamstarzchan, and was edited by yours truly (contact me). The image came from imageshack. Akakabuto is a bear named after the red fur on his back; Akakabuto simply means "Red Helmet". 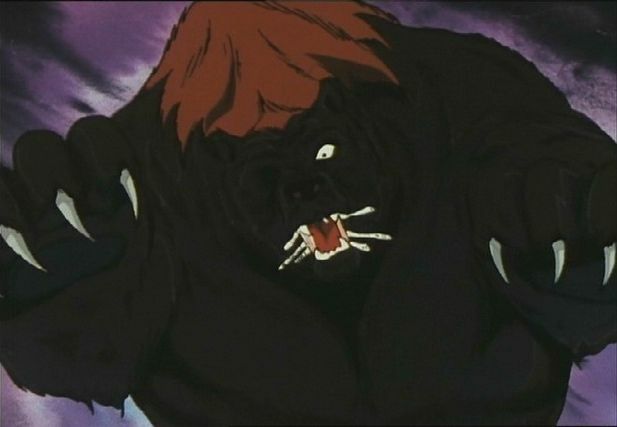 During a flashback in episode one, Takeda Gohei's bear-hound, Shiro, encounters this bear. Akakabuto rips Takeda Gohei's ear off, and as Shiro fights back, Akakabuto's right eye is shot off and both animals fall down a cliff. Shiro dies and Akakabuto survives. Problem is the bullet had damaged his internal system, thus making Akakabuto in an endless rage. He won't even go into hibernation because of this either. And because that Akakabuto is the terrorist that he is now, it's Takeda Gohei and Riki, Shiro's son, who's job is to defeat Akakabuto once and for all. Akakabuto is also the one who trapped Takeda Gohei and Riki into a gorge during Gin's birth. He only returned to them after Daisuke secretly planned to find Takeda Gohei and Riki to show them the older Gin. However during Akakabuto and Riki's fight, Akakabuto manages to throw Riki down a cliff where he is presumed dead. Then Akakabuto runs away after hearing some bullet shot sounds. Later in the series, we hear that Akakabuto is now building his own stronghold as he becomes power hungry. Some of the bear soldiers he gathers include Kesagake, Madara, Mosa and Sokkin, He even as a bear 'body double', who is supposed to be a replacement as Akakabuto when the real bear is away. This double body is named Gaki. During the final fight in the final anime episode, Takeda Gohei appears and shoots Akakabuto down. Believing that the bear is dead, Riki and Gin run to Takeda Gohei for a hug. But then Akakabuto springs back up is about to attack them, when Riki jumps up to protect his son and past owner. Riki gets wounded badly in the process and Gin uses the Zetsu Tenrou Battouga(The Deadly Strike) to behead Akakabuto, finally killing them. Then Riki makes Gin the new leader of Ohu before he dies. Akakabuto has only made a brief appearance in a flashback in Ginga Densetsu Weed. Akakabuto was also the main enemy in the prequel, Ginga Densetsu Riki, a manga made by the same creator of the series.